Morfang scanned the area and noted that a group of archers were waiting for him. Obviously stationed by the Prince’s orders. Morfang stood and placed the princess in front of him. The archers lowered their bows and he backed away, still holding her in front of him. He placed the knife against her throat again, warning them of what would happen if they dared to attack again. Once far from the woods, he released her. “Go home,” he snarled. He turned on his heal and stormed away. He knew she followed and picked up his pace. She did not lose step with his. He tried to change directions but she caught up to him with no time. After another hour of this, he stopped and she bumped into him. Morfang stared t the princess open mouthed. He was shocked and confused. And not without reason! Who would have expected an Elf woman of any age to speak so openly and so boldly? Not even their queens spoke so gallantly. Not even women of Man-kind were so daring. “Shut up,” Morfang snapped, turning away from her. This time, he walked slower so she could keep up with him. “You’ll probably find out on your own,” he added in a softer tone. Lindariel didn’t really understand why she felt she ought to stay with the Orc. Common sense told her to go back home and forget her thirst for adventure like a good little girl. But her heart screamed at her that if she returned, she’d never have the freedom she had before and that she’d be forever relying on the stories Legolas brought home. She wanted to see the world for herself before her father became too paranoid and sent her to the Grey Havens. With this (misplaced) logic, Lindariel decided to set aside her fear of the Orc and follow him, dangerous as it was. Whether he protected her or not was his choice. She doubted he would since he threatened her life numerous times already in one day. But it was the start of her adventure, and that was fine by her. The orc slammed his foot into her leg and she jolted awake, yelping. She grabbed her leg and massaged it. “Get up,” he snarled, picking up his belt. On both sides were holsters for his daggers. His sword, sheathed, was tied across his shoulder, enabling him to reach behind and pull it out of its sheath quickly. He buckled it in a swift motion and pulled Lindariel to her feet. She hobbled a little bit on one foot before they set off again. Lindariel limped after him for a short time, but after a minute, the pain ebbed and she walked normally behind him. Lindariel blushed a little, embarrassed by her ignorance. 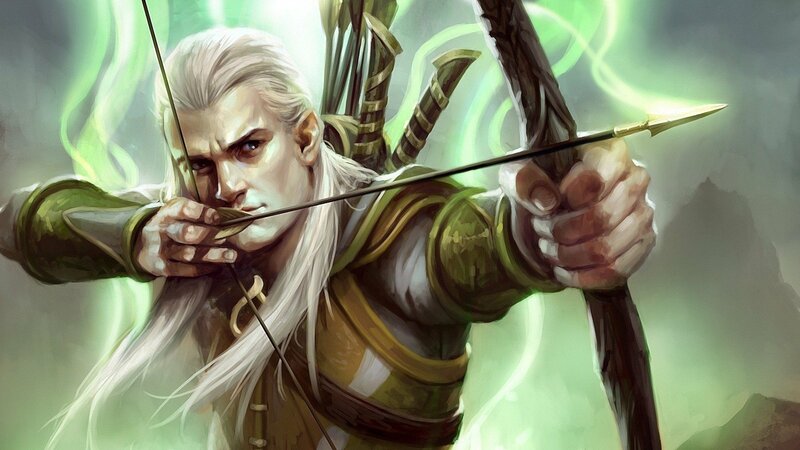 Legolas, she decided, might have known better of the nature of Orcs and their familial ties. “Don’t bother, Princess,” Morfang said, turning away from her again. Lindariel frowned and jogged to catch up to Morfang. “Perhaps I am,” Lindariel snapped, crossing her arms. “And I don’t think you’ll kill me, Morfang.” Of course, this was better left unsaid. Without warning, Lindariel was pinned against a tree with a dagger, once again, pressed against her neck. “Then why haven’t you?” Lindariel asked innocently. Really, she thought, can’t you do something a little more original rather than hold a dagger against my throat? Morfang snarled and removed his dagger from her throat, storming away. Confused, but otherwise undaunted, Lindariel followed Morfang. Despite his roughness, Lindariel wondered if he felt obligated to let her live since she had saved his life after they left Mirkwood. Or perhaps it was because she insisted on bandaging his wounds. Or perhaps both played a factor in her survival so far. The rest of the morning passed in silence. Around noon, Lindariel began to lose her footing and stumbled more. Morfang told her to wait up against a tree while he hunted. Tired and worn in only a few hours, Lindariel fell asleep. She was shaken awake and Morfang handed her a strip of wet, bloodied meat. “Eat it,” he demanded. Lindariel didn’t question him. She bit into the meat and almost spat it out. “It’s not cooked,” she said after swallowing. Morfang smirked. “Keep telling yourself that, Princess.” After making sure she could walk again, they continued their trek through the hot, open field. Morfang glowered at her and turned away. “You’re asking too many questions,” he snapped. Lindariel frowned and jogged to catch up to him.